African drum music would have to be one of the most vital, alive and emotional forms of music and percussion even in the 21st century. We can see its influence not just in alternative and world music but also in more 'modern' mainstream music genres like hip hop and dance. So integral, in fact, that early slavers recognised the power of African drumming music both as symbolism and as a means of communication, and banned the use or possession of drums in slave camps. It's only thanks to the indomitable spirit and perspicacity of the African people that this form of expression continued - they simply resorted to tapping out a beat on chest/arms/thighs and whatever else was available. The diversity of rhythm and sound that has grown from African drumming music is matched only by the diversity of the African percussion instruments that have made their way around the globe. The djembe drum is one of the most popular African percussion instruments and is incredibly versatile. A skilled djembefola (djembe master) can provide such a variety of djembe beats on one drum as to keep a whole room-full of dancers occupied. 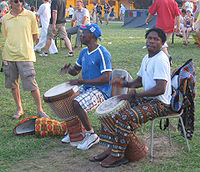 Djembe techniques are quite an art form on their own and a djembe player typically spends many years learning from a djembe master before becoming a djembefola in their own right. The kpanlogo drum originates from the Greater Accra Region in West Africa and is also known as a ceremonial drum. Because of it’s excellent ability to create sounds that carry over long distances, kpanlogo rhythms were often used as a way to communicate between tribes and family groups. 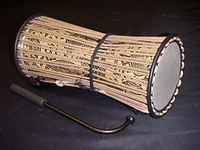 African Talking Drums are constructed from wood and rawhide and are shaped like an hourglass with the rawhide stretched across both ends, creating two drumming surfaces. Most often African Talking Drums are played with a stick on one side and with the hand and fingers on the other. As the name suggests, they were also widely used in communication. Now here's a drum that we've all heard of! 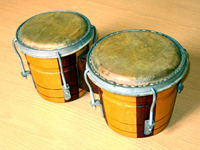 Widely used in Cuban drum music - and dance music throughout the world - it's believed that the African bongo became popular in Cuba as a result of the slave trade. This kind of drum is usually fairly squat and produces a beat with a fairly high pitch. 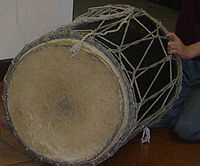 Dun Dun drums are also known as dundun drums and dun dun duuun and are believed to originate from the Malinke area of Mali. Dun Duns come in three sizes: Kenkeni, Sangban and Dununba (ranging from smallest to largest). They can be played separately but are also played strapped together in groups of two or three. These drums have a special connection to certain peoples in Uganda as ceremonial instruments. Clearly defining what is or is not an ngoma drum is a little difficult, as the word 'ngoma' is Swahili for 'drums'. The term is most often used for an ensemble of six or seven drums of different sizes strapped together and played as a group. The Itotele is a mid-sized, goblet-shaped drum that has become very popular in Cuba. Sometimes a waxy substance is used on the drumhead to create a duller sound. As can be seen from the variety of African percussion instruments that we've mentioned - and the dozens more that we haven't talked about - African drum music is diverse and is a fantastic form of artistic expression. It's a joy to create, and a joy to listen to! And if you simply want to dance to great drum music check out Music Mosaic's drum compilations. Did you know the large variety of drums? - And yes, they are played in our drum compilations. Percussion, pony drum, jun-jun drum, balafon, korlegonor, djembe, bunte, gome, blekete, dumbek, frame drums, khamak, dubki, dhol, khol, darbuka, kanjira tambourine, dun-dun, bendir, dhollo, def, tablas, davul, ia, itotele, udu-drum, ocarina-udu, zilla-drum, congas, talking drum, hoshso, bougarabou, bakdav drum, hi-hat, toms, mbira, oprente, kpanlogo, percussion, drum kit, ngoma, cajon percussion, drum machine, drum loops, balafon, tar, bells.